What's a wedding timeline and how do I make one? Just as a heads up, this timeline is for a 8 hour day of coverage, from 2:30-10:30 pm. You certainly can have more or less coverage, but this is just an average day at a wedding. 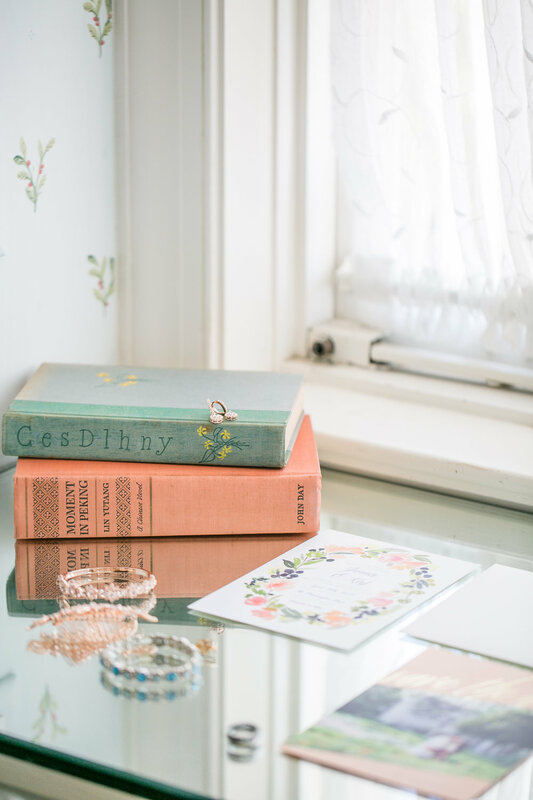 Every bride loves having those beautiful shots of her bridal details. It’s an important part of the story and I love having some time to shoot the dress, shoes, jewelry, invitations, etc. These shots allow me to get warmed up for the rest of the big day. I normally like to allow at least 45 minutes for this part of the day. While I’m shooting details, I’m also capturing some shots of the bride and her girls getting ready! If the groom is getting ready nearby, My Second Shooter will begin photographing the boys close to 40 minutes before the first look since it always takes them less time to get dressed! After the details have been photographed, it’s time for the bride to get into her dress! This is a big moment! I usually ask the mother of the bride and all of the bridesmaids to be dressed by the time the bride is ready to get into her dress. This ensures that everyone will look nice in those images. After the bride is in her gown, she can put on her jewelry, veil, shoes, etc. and I will shoot some additional bridal portraits! This is one of my favorite parts of the wedding day! I will find the perfect location for my couple’s First Look prior to the getting ready portion of the day. Don’t stress about that one bit! I will make sure the location is private and as secluded as possible. If you don't know what a first look is, or are on the fence about doing one, check out this article I wrote all about first looks. It just details out all the benefits of doing one, vs. not. After the bride and groom take their time with the First Look, I will begin taking a few romantic portraits of the two of them while the initial excitment is still present. I will find the locations for these shots as well! Remember, the LIGHT determines where we shoot and so I can’t decide exactly on portrait locations until the day-of. As we shoot these portraits, the bridal party can start making their way to us for Bridal Party portraits. Now it’s time for Bridal Party shots! I buffer in extra time throughout the day just in case we have some unexpected things that hold us up. (usually happens, totally normal so don't freak out!). One way to make sure we stay on schedule for bridal party portraits is to have someone put the boutonnieres on the guys BEFORE they arrive for portraits. During Bridal Party portraits, I will make sure to take some great shots of the guys and girls both separately AND together! After bridal party portraits are complete, the bride will go into hiding so that early guests don’t sneak a peek, and the ushers will begin their duties. If the reception is in the same location as the ceremony, I will use this time to shoot the reception decor UNTOUCHED. If the ceremony and reception are in different locations, I recommend having a cocktail hour outside of the main reception area if possible. That way I can grab some great shots of your reception before the night begins and guests start laying down purses and coats on their seats! It’s time to get married!! Most ceremonies are 30 minutes long. If your ceremony is longer than 30 mins, we’ll make adjustments to the timeline. Cherish these moments! Your ceremony will pass by so quickly. Family formals normally take place immediately following the ceremony. 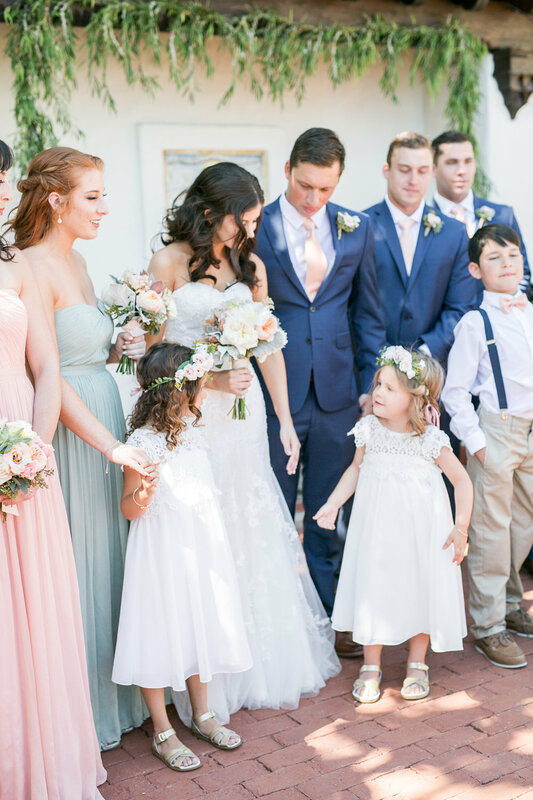 It’s best to save all of the family formals until after the ceremony because ALL family members will be present at that time. We’ll need about 30 mintues for family formals and I will send a questionnaire before the wedding where you can list out the shots that you want ( I recommend trying to keep it at around 10 essential images). I also recommend shooting portraits outdoors if possible so that they resemble more natural family portraits, especially if the ceremony location is dark! 7:00pm is the BEST time of day for portraits in the late spring, summer and early fall! This is when the sun is glowy and golden. I love having a few extra minutes with the bride and groom to take a few “Just Married” portraits right after family formals! This is when the bridal party lines up for introductions and the party begins!! By this part of the day, my timeline isn’t as strict. I work off of the natural light and so after the sun is set, my portrait time is over and I begin focusing on the reception events! My most popular package includes 8 hours of coverage so that I can be present for the main events of the reception and about an hour of dancing! If you’re interested in having your exit photographed, there are several options for this. You can either add additional coverage or plan a faux exit with just your bridal party. I have had GREAT success with this and the party never stops! EXTRA PORTRAIT TIME : AS MUCH TIME AS YOU’LL GIVE ME!